tuff stick Masking Tape is processed using hand tearable crepe paper, with single side rubber base adhesion. This Crepe Paper Masking Tape is used mainly in leather industries, painting (especially car, furniture, toy painting), The adhesive used allows the tape to be easily removed without leaving residue/ damaging the surface. 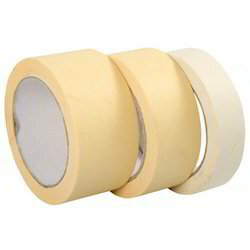 Masking Tapes used for various applications like masking, splicing, labeling, bundling and packaging. - One carton is 144" total except for 10mt tapes which is 188"
We are presenting a widespread verity of Masking Tape, which is prepared in accordance with present market trends with use of superior quality material and progressive machines. 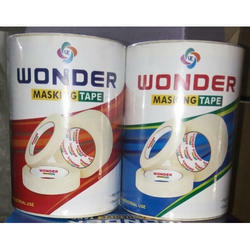 The tear resistance and high adhesive strength of these products are widely esteemed among the customers.